The warden of Stronghold Penitentiary struggles with the killing frenzy gripping his mind and attempts to order the guards to shoot the Possessor dead. They instead gun him down as the Devastator bursts through the wall, serving as a mindless pawn to the awakening Possessor. The duo then escaped from the prison, the news of which soon reaches the S.O.S. She-Dragon recites the information regarding the Possessor to Dragon, detailing how he had stopped breathing during radiation therapy. The details of the breakout are given but Dragon dismisses the whole affair, much to the shock of his teammate. She-Dragon assumed that as Dragon had been the only person to resist the Possessor’s abilities that he would wish to deal with the situation. It is pointed out by Dragon that he has no idea where the Possessor is but should he return, he will deal with him. Smasher arrives after having dropped off her daughter at pre-school and was more upset about being parted from Angel Murphy than she had been. It has been six months now since Dragon returned from the dead and they have been together for all of this time. Angel is going to be starting Kindergarten soon and the heroes are surprised by just how quickly time seems to be passing. Star drops by to inform Dragon that Stephenson has arrived and wishes to see him. It seems that Dragon has been undermining the authority of Sgt. Marvel, disrupting his training of new recruits. Dragon does not care for Sgt. Marvel who he believes is obnoxious and tries to pull rank simply because he was a war hero during the Vietnam War. Stephenson points out that Sgt. 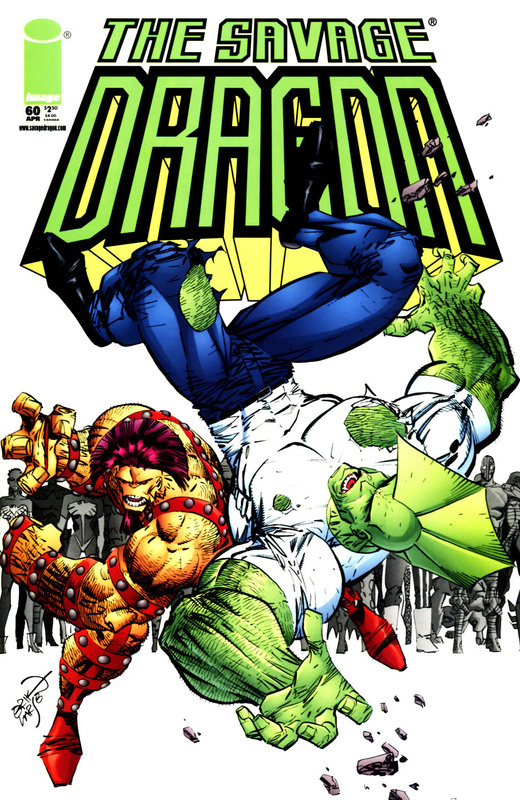 Marvel has worked wonders with both Barbaric and Ricochet and should be given a chance by Dragon. Stephenson then moves onto the real reason that he has come to Chicago, explaining that he would like to take Dragon back with him to Complex One. A recruitment drive is being held in Washington, DC and would like him to attend. Dragon points out that there are more super-freaks in Chicago than anyone else in the world and they should have held the event there instead. Stephenson declares that they can hold a similar event in the future but he must show some patience. The Deadly Duo are amongst hundreds of super-powered men and women who arrives at Complex One in the hopes of joining the S.O.S. and earning fame and fortune. Kill-Cat tries to cut in line and when he notices Bubble Boy near the front, he attempts to force his one-time partner to let him and the Kid Avenger in front of him. This leads to a fight breaking out between would-be superheroes and the entire crowd is soon gripped in a bloodlust. Dragon is assaulted by several of his allies as the S.O.S. and other heroes overwhelm him. The Devastator appears before Dragon but explains that he is actually merely a substitute body for the Possessor. He wishes to claim revenge upon Dragon for having previously caused his arrest and subsequent incarceration, leading to his body nearly dying during a radiation treatment. The Possessor has transferred his mind into the body of Devastator until his original form recovers. The Possessor agrees to have his mind-slaves all stand motionless along the walls of Complex One so that Dragon can face him one-on-one. They commence their battle and the Possessor reveals that voices speak to him in his mind, prompting him to commit murders and other crimes. He grows frustrated with Dragon avoiding his attacks which weakens his mental hold over the gathered heroes. The heavily-pregnant Widow had attended the recruitment drive and the stress put on her body has caused her to start having contractions. Rock calls out for Dragon to wrap up the battle and defeat the Possessor, causing him to unleash a powerful blow that decapitates the Devastator. Rock and the Shrew quickly rush Widow to hospital where she gives birth to a baby girl. Dragon later returns home to Chicago where he finds Angel asleep in the arms of her mother, disappointed that he had not been home when she came home from school. Smasher asks her boyfriend about the riot in Washington but the incident is dismissed as nothing serious. Dragon then chooses this time to propose to Smasher who immediately accepts the offer of marriage.